Ever since I first found out that I was going to have a May baby, I dreamed of planting a vegetable garden every year around his or her birthday. It took me until my 30s to realize the rewards of eating homegrown food, let alone planting and nourishing anything, then watching it flourish. In my pregnant daydreams, this child and I would play with plants in the dirt, then water and watch things grow together. On the languid evenings between late July and the early fall, we would happily eat our homegrown “birthday” tomatoes and cucumbers in celebration of his or her life and good food. I just had to keep my fingers crossed that this child would actually enjoy vegetables. Now 14 months, Declan screams for bananas and berries in the grocery store aisles, so far mostly unaware of the sugary pleasures of things like chocolate and cookies. The other day he reached out his hand and cried as a bag of avocados rode past him on the conveyor belt in the checkout line, oblivious to a quart of ice cream. “Aha, you have one of those fruit and vegetable babies there, don’t you?” the woman bagging the groceries said. Last night we stopped for sweet corn at Lynd’s Fruit Farm and walked past a table of tomatoes. 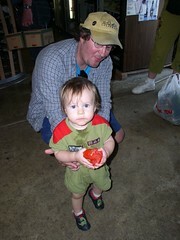 Declan started to grab one, which would have caused an avalanche, so I redirected him to walk toward his father. There was another table of beefsteaks on the path, and before either of us could do anything about it, he had one in his hand and took a bite out of it like an apple. Customers and the owners all laughed as they watched him chow down as though his life depended on it, juice and seeds seeping down his chin. Granted, a few more tastes of confections could change his tastes completely in the next couple of years, but so far, the gardening assistant of my daydreams lives on.